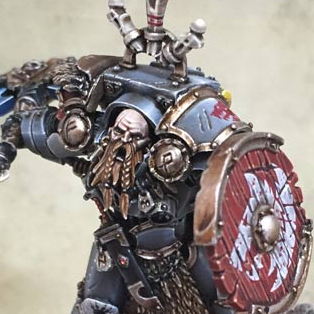 If there is one Heresy model I have seen so far that screams Space Wolf to me, it's this guy right here. He's just got the perfect level of barbarism. Before I get onto the awesome conversion I want to talk a bit about the painting. I know this is a bit backwards from how I normally do it, but trust me I have a reason. I really love the desaturated colors used here as well as the shade of blue grey used for the armor. A lot of Heresy-era Wolves have pure grey armor, so I'm glad to see a bit of the blue mixed in. I'm also a fan of the brown colors used to shade it. This guy really only consists of a few colors, the blue/grey, brown and bronze, white and bone, the red spot color, then of course the face and ax. Even the face has a fare amount of red in it which helps tie it into the other reds. I feel like a restricted color palate like this really helps to show off the techniques on display, as well as making the model more realistic looking in general. 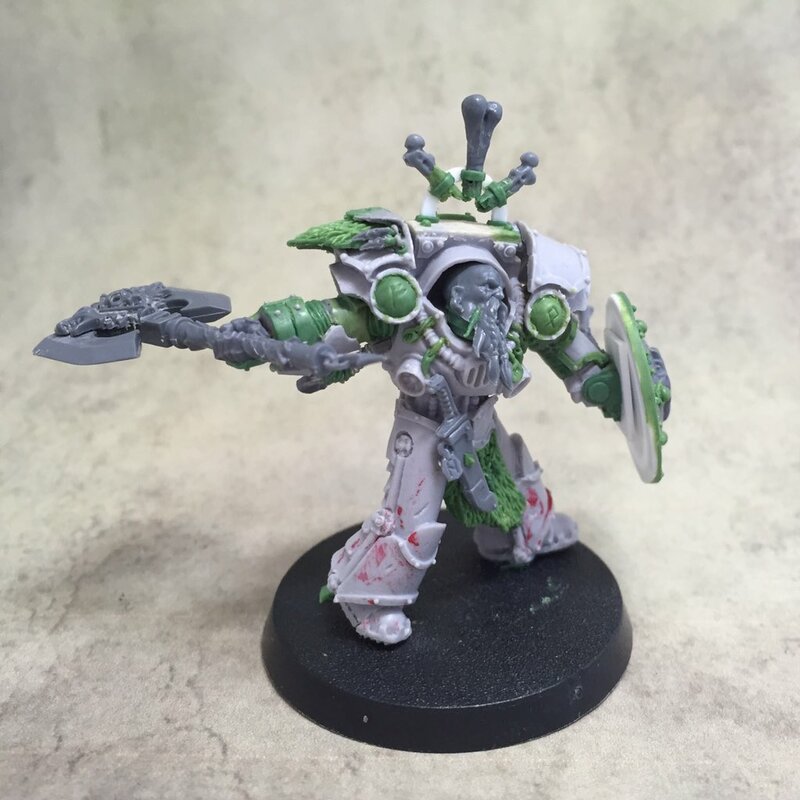 I especially think the use of red as a spot color is effective since it's a dead Thousand Son on his base. I could keep going over the other great areas, such as the subtle battle damage or the freehand, but I think the painting speaks for itself. All of this is of course greatly helped by the fantastic conversion job. Here you can see the model still in the WIP stages, and all of the work that went into it. The amount of stuff scratch sculpted on here is pretty crazy and all of it looks absolutely professional. Looking at the painted model you can't even tell what's not part of the original model, a true sign of an expertly converted model. 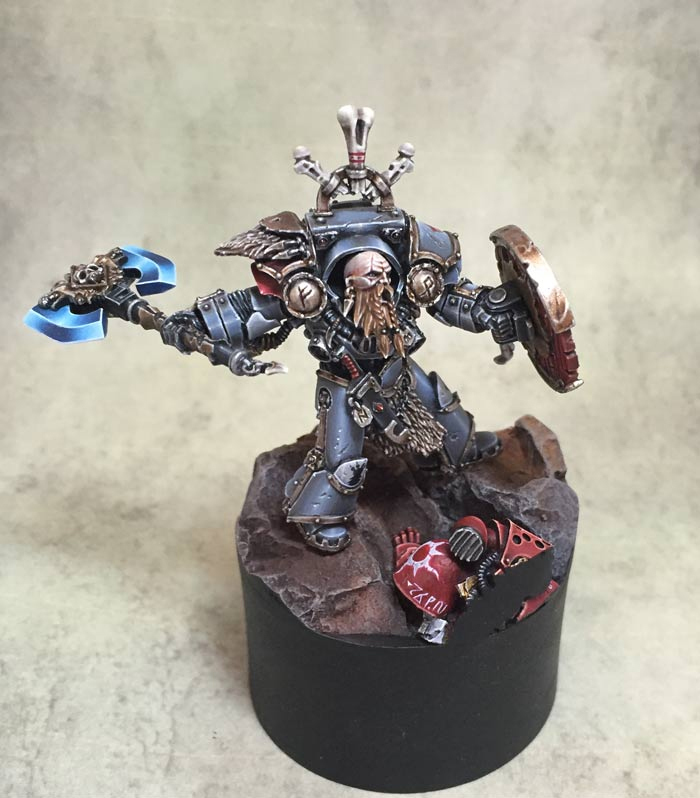 It's not wonder this mini went on to win silver at the 2016 Horus Heresy Golden Demon. Be sure to check out more views of the model on Cool Mini or Not, and show the artist some love if you like it. You can also follow Neil on his Instagram at @neilpaints which also happens to be his Twitter handle. You can also listen to him on the podcast The Imperial Truth alongside Greg Dann. It's a great podcast for all things Horus Heresy. Feeling inspired by all of this Heresy goodness? Don't forget that the Horus Heresy limited edition Praetor is available this weekend at all GW stores. 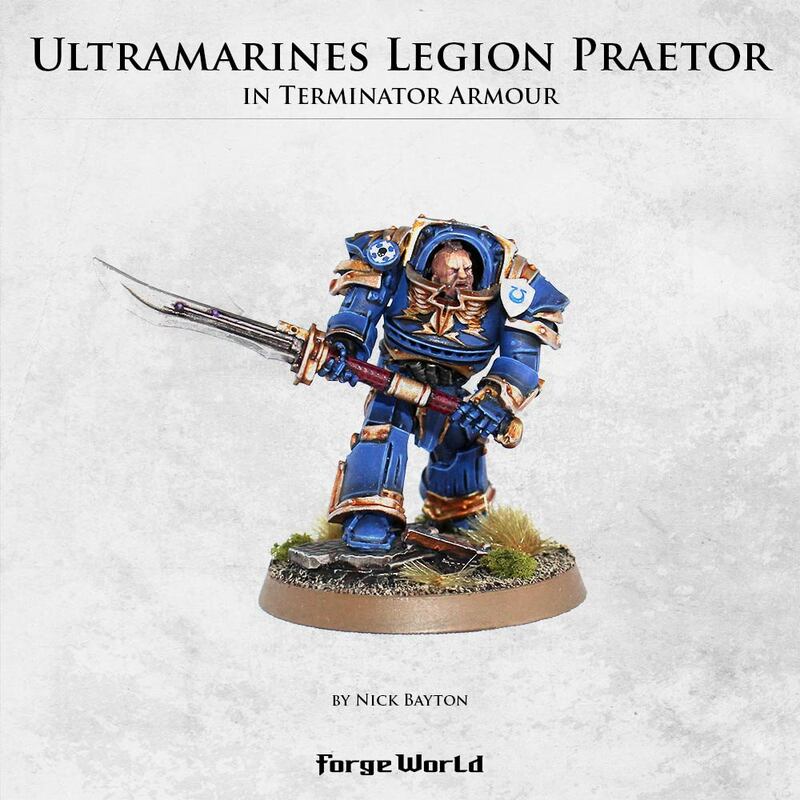 You can see one painted up as an Ultramarine by Nick Bayton of the Warhammer World Events team above. 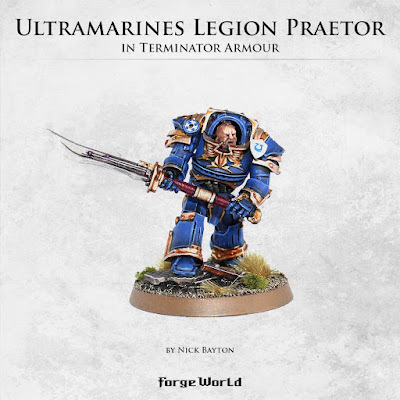 It's pretty exciting to see a Forge World model sold at a GW store, hopefully this is just the start. Neil has told me that he plans on picking one up himself to paint, so be sure to keep an eye out on his Instagram and Twitter for progress on that in the future. He's also working on a pretty sweet looking rendition of Perturabo at the moment to bide you over until then.